Mr. Gurry welcomed Mexico’s accession, noting that “Mexico is the third country in the Latin American region to join the Madrid trademark filing system. Its accession to the Madrid Protocol will assist enterprises in Mexico that are seeking to expand their markets overseas. 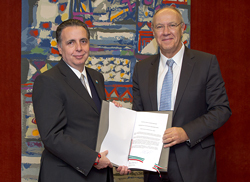 It will also assist WIPO in achieving its objective of transforming the Madrid System into a system with truly global reach.” He also congratulated Mexico’s Institute of Industrial Property (IMPI) and its Director General, Dr. Rodrigo Roque, for putting in place state-of-the-art practices that are supported by a modern information technology infrastructure and by competent human resources. Mr. Gurry said that “Mexico’s legal and institutional framework will guarantee the successful implementation of the Madrid Protocol in Mexico,” noting that IMPI is among the top fifteen IP offices receiving the highest number of trademark applications worldwide. Mr. Ferrari said that “brand owners in Mexico stand to greatly benefit from the Madrid Protocol.” He observed that Mexico is the 11th largest world exporter and has the highest value of exports in Latin America, 80% of which are manufactured goods. In relation to Mexico’s GDP, it is the third largest exporter in the world of high tech products. It is also a G-20 economy with a trade volume of over 700 billion dollars in 2011. This increased by 20% between 2008 and 2011, in spite of the global economic downturn. Mexico becomes the fourth Spanish speaking country in the Madrid system. Spanish was introduced as a working language of the Madrid system in 2004. This has facilitated the way for the expansion and consolidation of the Madrid system in the Latin American region. This year, the Philippines, Colombia, New Zealand and Mexico have acceded to the Madrid system, resulting in a geographical expansion of the system.